Unroll crescents into two long rectangles onto a baking pan. Spray with butter. Sprinkle with cinnamon sugar mixture. Bake at the recommended temperature on the crescent roll can until they look done. It will not take as long as recommended on the can and you do not want to over-bake them. After removing from oven, cut in 1 inch strips…perfect for dipping! Mix together. If icing is too runny, add more powdered sugar. If too thick, add more milk. Should be a dippable consistency. 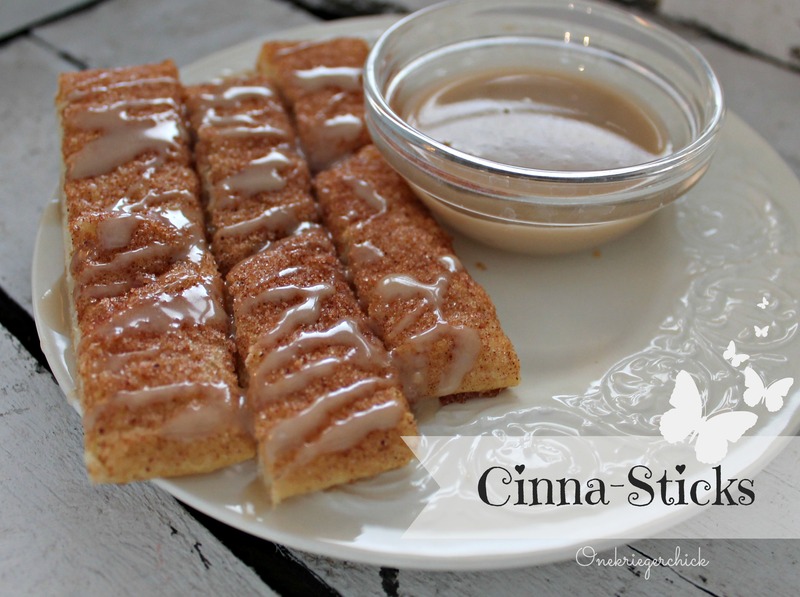 Serve in a small bowl with Cinna-sticks and Enjoy! Note: These are not exactly like Pizza Hut’s, but they are delicious and highly addictive! What kid doesn’t like icing for breakfast?! These are quick, easy, frugal and your kids will have fun helping you make them…Enjoy cooking with your kiddos! Posted in Uncategorized and tagged baking, breakfast, cinnamon sticks, cooking with kids, crescent rolls. Bookmark the permalink.